Is your data covered 24/7 365? 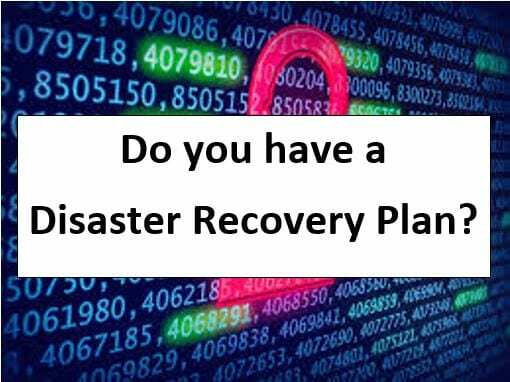 Do you have preventative measures in place for a Disaster Recovery Plan (DRP)? No one likes to think a disaster is going to happen to them, however, preparing for disaster situations and putting in place plans for recovery can make all the difference between businesses that are able to successfully manage a crisis and carry on trading. For the most part, today’s office technology is very reliable and major system failures are few and far between. However, occasionally systems such as hard drives and system software on Servers or PCs can, without notice, stop working. When that happens, a business can also stop working. Companies are still falling victim to Ransomware, Cyber attacks and even User error. This could be a single file affecting one or more employees, or the whole Company and Clients. Depending on what happens next could mean that you lose Clients and ultimately the business and many never even recover! If your data and files become encrypted by a form of Ransomware, the best thing that you can do is to restore the systems that have been affected. Depending on your backup and /or DRP this may or may not be straight forward and can be very much like ‘how long is a piece of string’. For our clients we have put systems in place where we have been able to recover systems from as little as 5 minutes before the incident occurred during the normal working day.